Dinner – A Healthy Pinch. Oh how I wish I had taken more pictures of this pizza! Dinner was actually ready before the sun went down, before our toddler went to bed so we got to eat together. During the daylight. Win for us! So we’ll keep this short and sweet. If you have the time, roast your own peppers until they’re blistered and quickly marinate them in a bit of olive oil and chopped basil. It makes all the difference in the world. Promise! 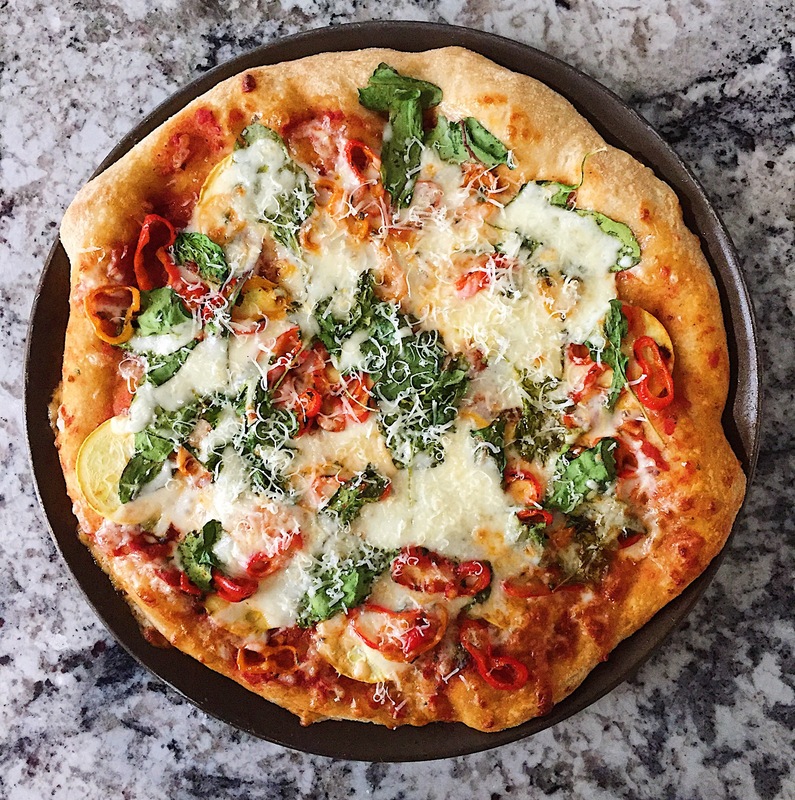 Since we add some lemon zest to the sauce, this pizza with all its veggies feels summery and bright. You might eat 3, 4, 6 slices and not even notice! Preheat oven to 450º. Shape dough in a circular pizza pan to the edges and set aside. Heat a dry sauté pan over medium-high heat. Add the sweet peppers and roast on each side until partially blistered. It’s ok if there are a few black spots. Remove from heat and slice into rounds. In a small bowl, toss roasted sweet peppers with the olive oil and chopped basil. Set aside. Spoon sauce evenly over pizza dough. If using pepperoni, add it to pizza first. Then top with sliced summer squash (though you may not want to use all of it) and the sweet peppers with basil. Then add your greens and sprinkle the mozzarella over the top of everything. Bake for 12-15 minutes until cheese is melted and bubbly. Once pizza is out of the oven, sprinkle some freshly shredded Parmesan over the top, slice and devour! Combine olive oil, red pepper flakes (if using), sea salt and garlic into a cold sauce pan. Stir while you heat the sauce pan over medium-high heat, about 45 seconds or so, making sure the garlic doesn’t burn. Add in the tomatoes and just a pinch of sugar; let simmer for a few minutes. Taste and add more salt if needed. Stir in lemon zest. 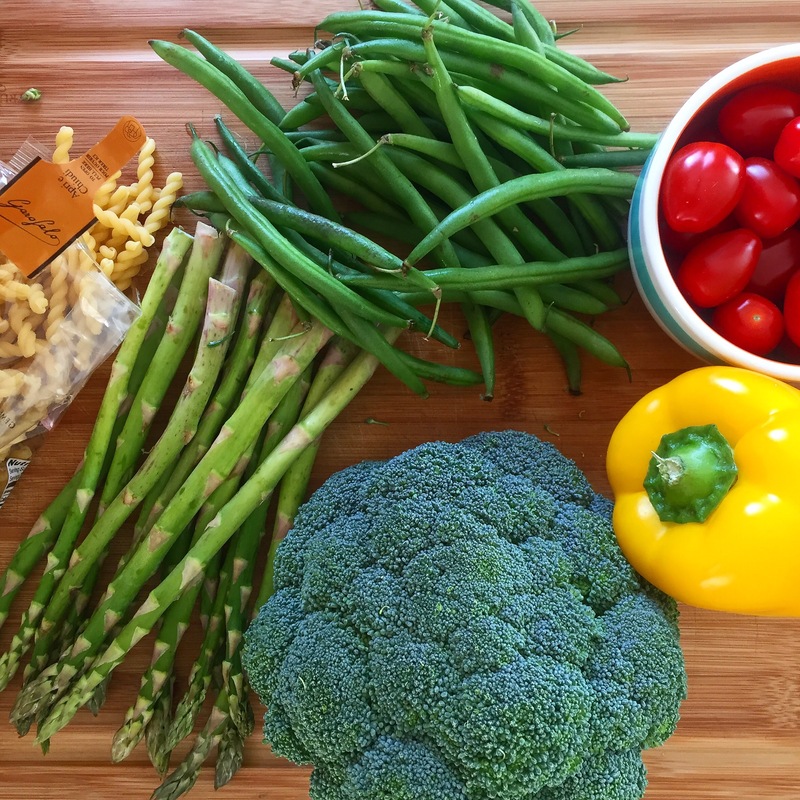 Bring on the veggies! That’s what spring is all about, right? Some would say pasta is the ultimate comfort food and I am not here to disagree. Sometimes it’s as easy as throwing pasta in some boiling water and tossing the noodles with a jar of pre-made sauce and calling it a day. Though it may be intimidating at first, making sauce from scratch is not that difficult and if you have the inclination to do so, it really is worth the extra effort. 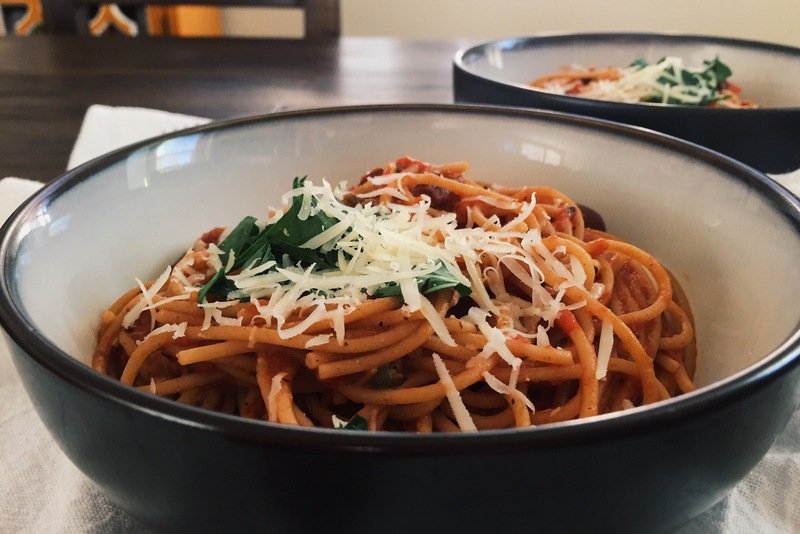 This is a take on a puttanesca sauce, which includes the briny tang of capers and Kalamata olives, however, with a simple pomodoro sauce in mind, I added a bit of ghee (or you could use a pat of butter) to really round out its flavor and then stirred in about a ½ cup of pasta water to make the sauce cling to the noodles. 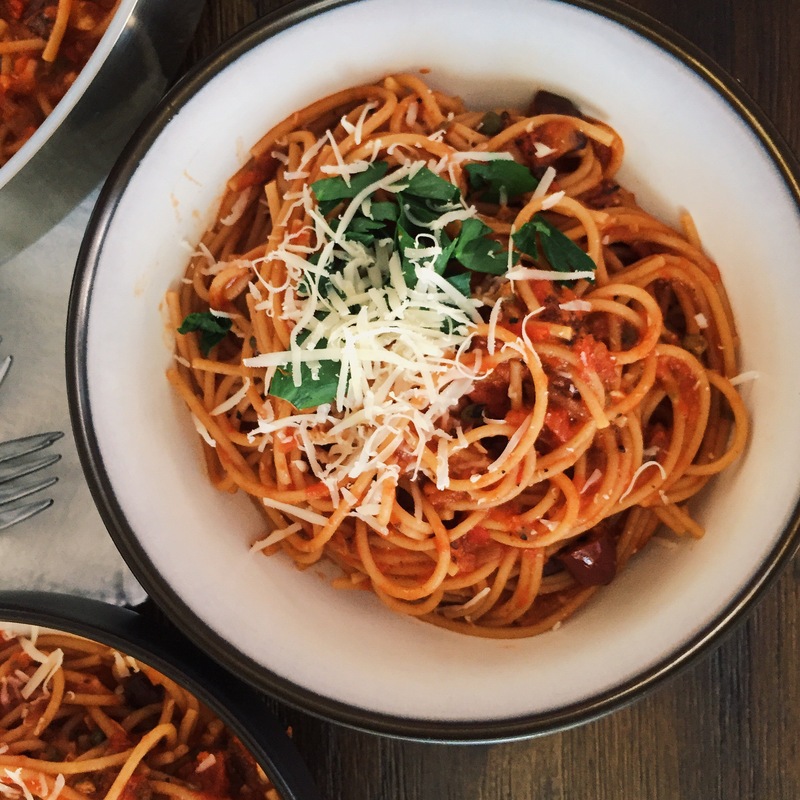 You can pump up the nutrition a bit by using whole wheat spaghetti or even zucchini noodles or toss in some extra veggies such as squash, broccoli or spinach. This time, I just wanted a simple pasta dish with a sauce that I could call my own. 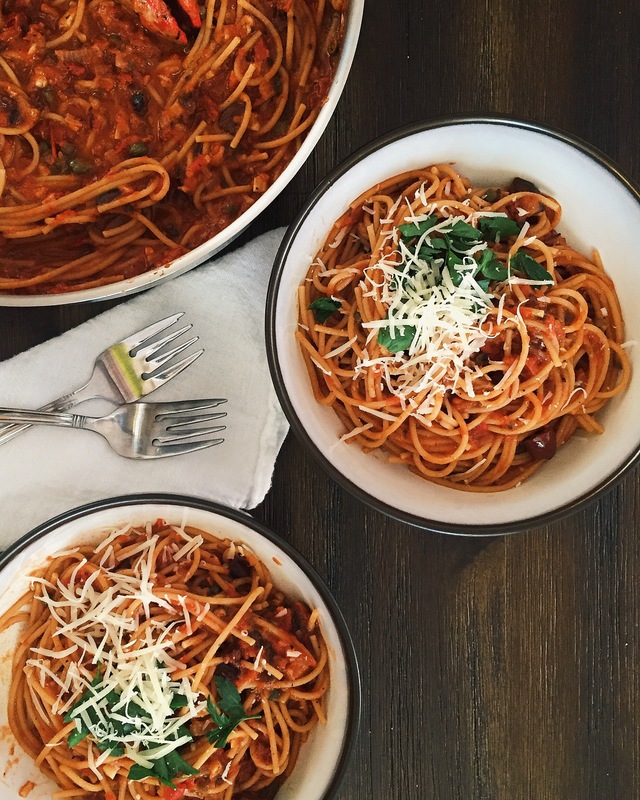 Whole-wheat spaghetti tossed in a slurp-able sauce and punctuated with the briny tang of olives and capers really doesn’t get much better! Unless you top your bowl with Parmesan cheese and basil…and then it does. I used Muir Glen’s fire roasted tomatoes which, to me, are the best! Heat olive oil in a 12 inch skillet over medium-low heat. Add minced shallot and cook, stirring frequently, about 8-10 minutes until soft. Add the garlic and cook, stirring, for 2-4 minutes. Add the crushed red pepper flakes and cook another minute longer. Increase the heat to medium and season with kosher salt. Then add in the pureed tomatoes, kalamata olives, capers, olive brine, caper brine and sugar. Cook, stirring occasionally, until sauce thickens slightly and flavors come together about 20 minutes. Remove pan from heat and stir in basil sprigs and set aside. Meanwhile, bring a large pot of water to a boil. Season with kosher salt and cook spaghetti, stirring occasionally until about 2 minutes before noodles are tender. Reserve about ½ a cup of pasta water while draining pasta. Discard basil in skillet and warm sauce over high heat. Stir in pasta water to loosen sauce, and bring to a boil. Add noodles and cook, stirring so sauce coats the pasta, about 2 minutes. Remove pan from heat and add ghee and ¼ cup of parmesan cheese. Toss together until cheese and ghee melt. Serve into warm bowls and top with more parmesan cheese if desired. When the temperature breaks 100° for at least five days in a row, the kitchen is one of the last places even I want to be. Ok, that may not be a completely true statement since I can’t stay away from cooking for more than a day. 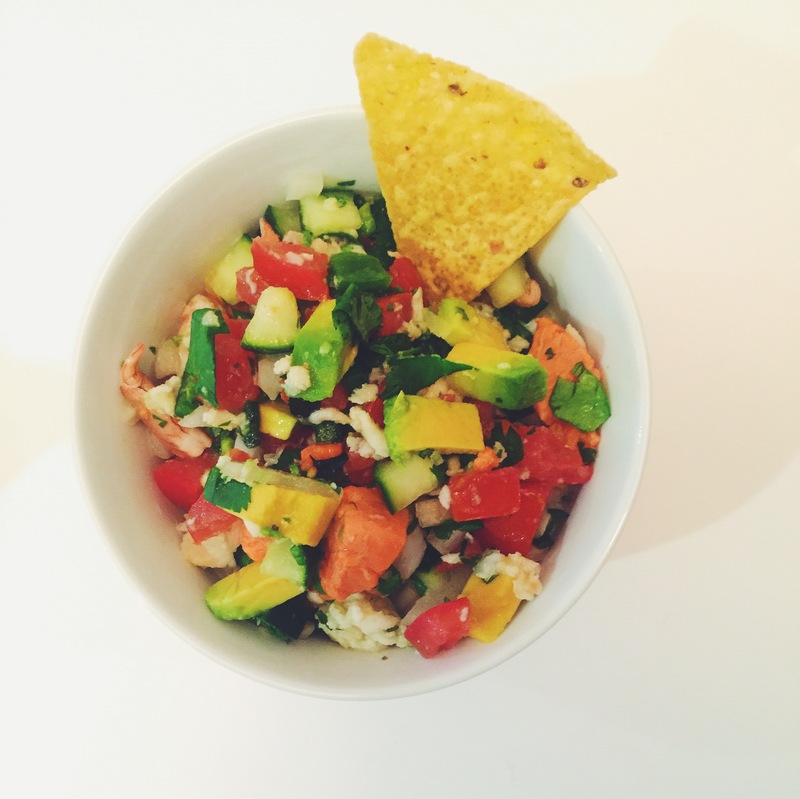 But what better way to combat this crazy heat than with a super refreshing ceviche?? This dish satiates my need to be in the kitchen without turning on the stove or the oven. Win-win. Ceviche is a dish ordered often around these parts and my husband and I typically eat it as an appetizer or snack whenever possible. That being said, it is extremely easy to make yourself and completely customizable to suit your tastebuds, so why not give it a go? If you’re not familiar with the ceviche, it’s a dish comprised of raw seafood that are essentially “cooked,” or cured, by marinating it in a bath of citrus juice for at least two to four hours. In this recipe, we opted to marinate three types of seafood: wild-caught Alaskan salmon, snapper and shrimp, finding the flavor was better the longer they marinated. Since you’re working with raw fish, the dish will only be as good as your ingredients so I recommend purchasing the best quality available. It is a waiting game with this dish, so plan accordingly! Once the fish/seafood are done “cooking,” it’s time to get creative with your add-ins. I loaded mine up with fresh tomatoes and a cucumber for some freshness, onion for a crunchy bite and a roasted poblano for a hit of smokiness. Finally, a generous bunch of chopped cilantro to garnish, which is absolutely necessary. Dare I say perfect? At least for this home cook it was! This is a no-cook dish and perfect for summer. Serve as an app with a bowl full of tortilla chips or top some butter lettuce and eat as a side or even an entrée. Feel free to switch up the fish, use only one type or all three. 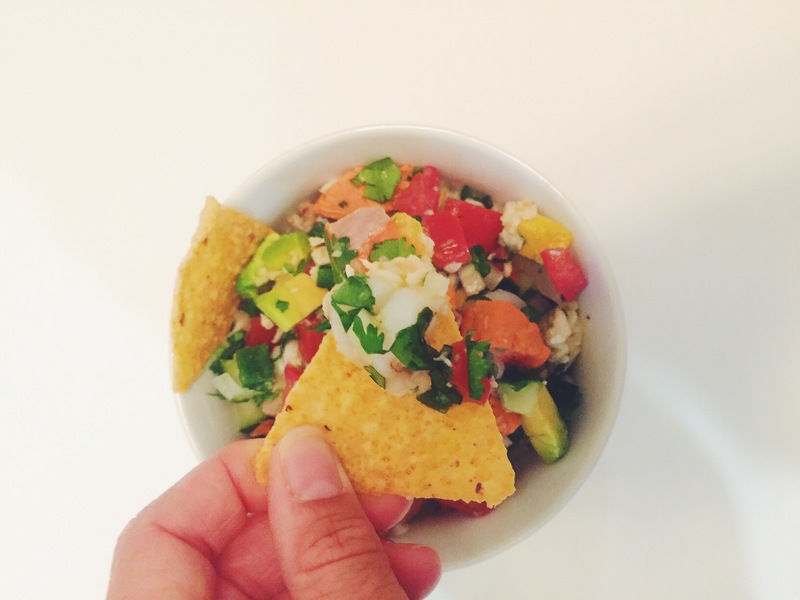 Either way, this ceviche is the perfect accompinament to a warm summer evening and and ice cold beer. The idea is to chop all ingredients roughly the same size. In a medium-sized bowl, combine the salmon, snapper and shrimp. Set aside. In a blender or food processor, combine the lime juice, garlic cloves, sea salt and serrano chiles and blend until smooth. Pour the mixture over the fish and toss a few times to make sure everything is completely incorporated. To marinate the fish, cover the bowl with plastic wrap and refrigerate. Typically the fish will be ready to eat in about two hours, however, the fish will be completely “cooked” in about four (which is how long I waited for mine). Once the fish is “cooked” to your desired doneness, toss in the remaining add-ins: tomatoes, cucumber, onion, poblano pepper, avocado and cilantro. Mix everything together. Taste and add more salt as desired. I feel like this recipe isn’t really a recipe since I’ve made this countless times, changing it up a bit here and there throughout its rotation in my kitchen. What remains constant, though, are the Mediterranean flavors woven throughout the dish- a good dose of chickpeas for protein and fiber, kalamata olives for a briney bite, artichokes and kale because vegetables are a must and a solid helping of farro because it’s my favorite grain and adds a nice chewy texture. 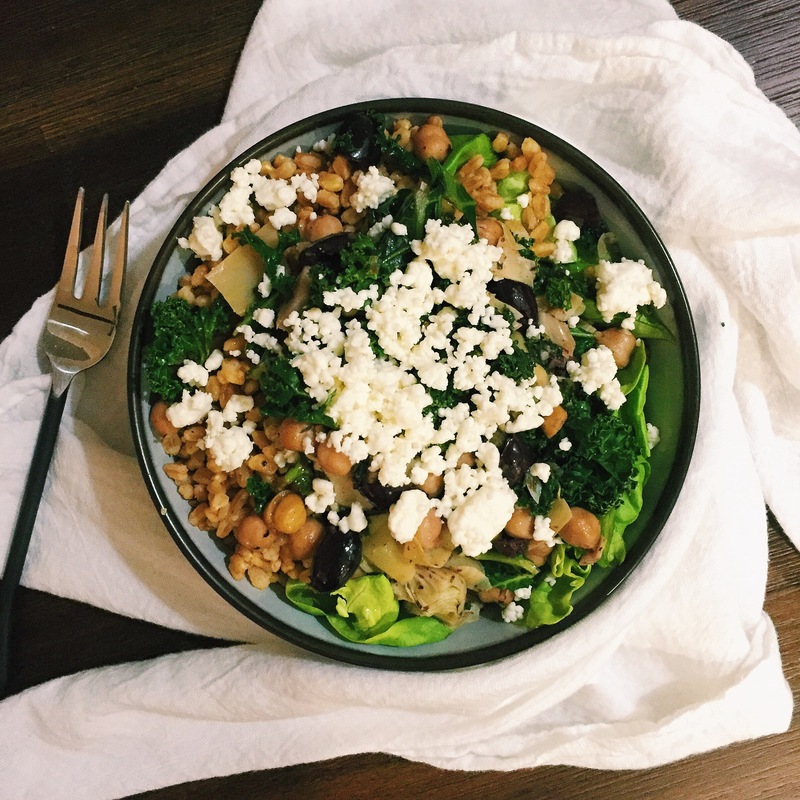 There is, of course, feta on top because cheese is a staple around here and its saltiness is perfect.